It is said the secret to healthy, colorful, Japanese koi is the clay mud in which they are raised. MICROBE-LIFT/Calcium Montmorillonite Clay comes from one of the highest calcium clay deposits in the world. Calcium based clay may help your pond water to produce some of the healthiest and deep colored koi you’ve ever raised (or seen)! The koi’s markings will become brighter and more dominant. Plastic pre-formed ponds, as well as vinyl, cement and rubber ponds, do not have any nutrients on their bottom. In the wild, carp use mud to get many of their micronutrients and minerals. MICROBE-LIFT/Calcium Montmorillonite Clay has a negative electric charge which will bind the clay particles to positively charged toxins in the water. 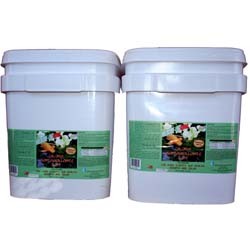 MICROBE-LIFT/Calcium Montmorillonite Clay is not only a nutrient source for koi, it will also “polish” your pond water. The clay acts as a natural flocculent and the particles that are bound up are filtered out of the pond.